Cilantro is often referred to as coriander. It’s one of the basics planted in most herb gardens indoors and out. It’s relatively easy to grow. Cilantro strongly resembles parsley because it’s a member of the parsley family. Although, cilantro plants at maturity are more feathery in appearance. Cilantro is an annual. This means a new crop needs to be planted after the plant matures or goes to seed. Some individuals know it as “Chinese Parsley.” Cilantro is an herb with many nuances. The flavor is distinctive. It’s sold in freshly grown bunches, dried in powder form or in whole seeds. It’s used in many Asian, South American and Mexican recipes. Growing cilantro indoors is the best way to have ready access to this herb. Cilantro has a more pungent flavor when it is fresh, than when it is dried. The other advantage of this plant is the abstract design it creates as it is growing. Cilantro, like parsley and other green leafy herbs needs bright sunlight. Cilantro, like oregano, it is delicate and more difficult to grow. Local garden centers often sell “starter” pots of cilantro that have been germinated and allowed to take root. This is the fastest way to grow cilantro indoors. These are plants about two to three inches in height and are quite healthy. Since cilantro is an annual, indoor gardeners plant starters for faster harvest from their plants. To grow cilantro indoors, plant it at intervals for a continuous supply. With starter plants, the time it takes to harvest is shorter. Because starter plants of cilantro are already planted in soil, simply remove the starter pot and place the plant into a container at least twelve inches deep. Cilantro has long stringy roots. Make sure the container has good drainage. Fill the container three-quarters of the way from the bottom and add potting soil. Place the starter plant, soil and all, in the potting soil in the center of the container. Cover with more potting soil to about one-quarter inch beneath the base of the plant. Cilantro does well in clay pots or plastic containers. Choose a window or sunny area that gets full morning sun. Cilantro prefers dappled afternoon sunlight, rather than direct sunlight all day. The soil should be kept moist. Avoid soaking the soil or the roots of the plant will rot. Room temperature should not be below 70 degrees for best growing results. One way to gather cilantro seeds for future plantings indoors is to allow one of the existing plants to go to seed. This means that the plant will age naturally to the point where the plant produces white or pale pink blossoms. It’s important to note that cilantro goes to seed more quickly than other herbs. Seeds will drop onto the soil in the container and new plants will germinate. However, to start cilantro from seeds, the simplest way is to place cilantro seeds in a shallow dish of water overnight to moisten them. Then, place them in a plastic sandwich bag and seal it. Place the bag in a moderately sunny spot for a day or two until a tiny white sprout appears on the seeds. Make sure the bag retains moisture. If not, add more water. Once sprouts appear, add a little potting soil to the unsealed bag. As the seeds begin to expand and sprout, remove them from the bag and plant them in a container filled with fresh soil. Cover the seeds with a light layer of potting soil and mist lightly. Place in a sunny spot for up to four hours. Allow the plant to have another four hours of dappled sunlight. All indoor gardens need some sense of order and design. So does an indoor cilantro garden. Since cilantro plants have a wispy design as they grow, it may be a good idea to purchase plant stands to keep cilantro plants in order of their harvest time. 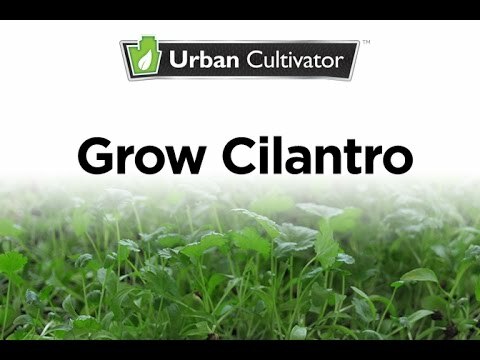 Plant two or more cilantro plants in each quarter of a season for the most abundant harvests. 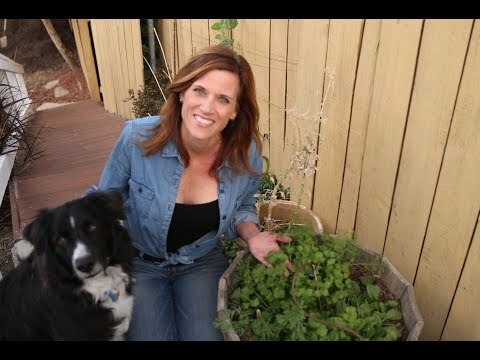 Consider planting cilantro in a large container with other types of herbs. You’ll need a fairly wide, deep container for this. Choose one that is twelve inches in height and ten inches across. Fill with potting soil three quarter inches from the rim. Create a circular design by planting one “row” of dill seeds around the rim of the container. Plant a row of basil seeds next and follow with a row of cilantro seeds. In the center of the container, plant chive seeds. Add a light layer of potting soil and mist with water lightly. Place in a sunny area of the room. Each species of herbs vary in the time it takes for them to germinate. Dill germinates quickly as does basil and cilantro. Chives may take slightly longer. The result will be a lovely “bouquet” of herbs growing neatly in a single large container that provides several harvests. Dill, basil and cilantro are all annuals. Chives are biennials. This means that different herbs can be planted in the same design after the herbs are harvested and begin to turn to seed. Cilantro should be harvested when the plants reach a height of at least six inches. This is when the leaves will be most tender and least bitter. Note that all of the parts of the plant are edible. However, the stems tend to be slightly more pungent than the leaves. To harvest seeds, allow the plant to develop blooms and seed heads. There will be several seeds in each seed head in most cases. The harvested seed heads should be a brown color. The color indicates they have reached the right stage for harvesting. Allow harvested seeds to dry before using them in recipes. Dry them in an oven at the lowest temperature for five or ten minutes. They should be dried, not roasted. You can tell when oven-dried seeds are done. They are no longer flexible and feel dense and hard to the touch. To store them, place them in a paper, not plastic, bag until they are ready to be planted. Cilantro is most flavorful when it is freshly cut. To use cilantro seeds in recipes, use a mortar and pestle to mash the seeds into a fine powder. In certain recipes, whole cilantro seeds are used to accent meats, poultry and fish. Powdered cilantro is often used in sauces, breads, cakes and dessert recipes. Added to a strawberry rhubarb pie filling, cilantro gives the pie filling more body. There actually is a difference in the flavor of fresh and dried cilantro. Once cilantro has been dried, it loses its unique pungent aroma and flavor. Dried cilantro takes on a flavor similar to a blend of nutmeg and anise. Many soups and sauces require a bundle of fresh herbs to add flavor. Tie freshly snipped cilantro sprigs with basil, thyme, oregano and sage to create a Mediterranean Bouquet Garni. Cilantro gives salads an interesting nuance. It can be eaten raw or cooked. Eaten raw, cilantro has a stronger flavor than when cooked. The hint for using fresh cilantro in recipes is to use it sparingly to avoid the flavor overwhelming other ingredients. The pride of any indoor gardener is the display of their “green thumb.” Herbs are a wonderful addition to an indoor garden. Cilantro makes a showy display with its deep green color and delicate flowers. Consider using cilantro in an herb wreath. Cut sprigs of cilantro and add them to a living wreath with bay leaf, dill fronds and thyme sprigs. Cilantro grows in a symmetrical shape which adds interest to a garden display. Once it has taken root and begun to show growth, it’s as easy to maintain as most herbs. Unlike other herbs, though, cilantro doesn’t mind germinating in potting soil used for previous planting. Some say that cilantro is an acquired taste. Yet, many four and five star chefs regularly require freshly grown cilantro for their recipes. Share your cilantro with friends and family when it grows in abundance. There’s always another crop of cilantro ready for planting indoors on the calendar. Plant a lot and plant often. Ok this would be helpful if it didnt have two pages on what, where, and how cilantro grows, tastes, and other names. Couldn’t even see where the planting instructions were. The method for starting cilantro from seed did not work at all. Brand new seeds soaked overnight, left in a plastic bag with some water in direct sunlight…sat for 4 weeks and then began to mold. Does it need a certain number of “cold days” like some other crops?